How to dig deep into the world of data with hands-on using machine learning ? 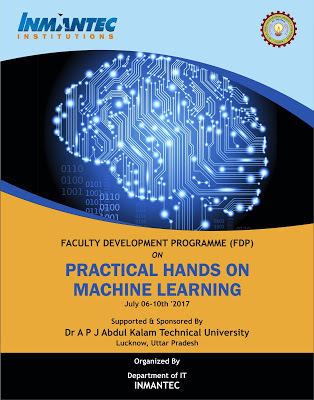 The main objective of the 5 days workshop on Practical Hands on Machine Learning will provide real life hands-on sessions. The workshop will touch upon real world problem solving code and working examples for the most common machine learning techniques used by developers and technical professionals worldwide. These session contains a breakdown of some Machine Learning variant, explaining how it works and how it is used in industries. The workshop will rotate around Machine Learning concepts using Python code with IPython console, Jupyter Notebook tools. The workshop will start with focus on data preparation, handling and manipulation using Pandas, visualizing statistical data with Seaborn, Fitting statistical models with statsmodels. The workshop will be more problem solving than digging into Theory. Training the model developed is an essential part of the Machine Learning therefore techniques like supervised and unsupervised learning will be used. A full exploration of the various types of learning algorithms illustrates how the proper tools can help any developer extract information and insights from existing data. At its core, machine learning is a mathematical, algorithm-based technology that forms the basis of historical data mining and modern big data science. Scientific analysis of big data requires a working knowledge of machine learning, which forms predictions based on known properties learned from training data. Workshop will also Introduce audience with Data Analytics, Linear Regression, Logistic Regression with different case studies to explain the deeper level concepts. The program is open to faculty members, Research Scholars and Industry Professionals. Participation certificate shall be awarded to all the participants on the concluding day. An engineer from university of Pune. Presently working with Juxt Smart Mandate as Practice Lead- Data Science. Worked with organizations like Cube26, iDataLabs, Enthought as a Data Scientist. An engineer from NIT Kurukshetra and Masters from Stanford Centre for Professional Development, USA. Presently working as Product Manager at Myoperator. Worked with Facebook as a Junior Research Scholar, 1mg.com and many more.